'Pepper Spray Cop' Suit Filed : The Two-Way Some of the Occupy protesters who famously got face fulls of pepper spray last November on the campus of University of California Davis have taken their case against the school to federal court. Nov. 18, 2011: Occupy protesters get sprayed at University of California Davis. Some of those Occupy protesters who famously got face fulls of pepper spray last November on the campus of University of California Davis have now filed suit in federal court. They allege "the university used excessive force to break up the demonstration," The Sacramento Bee writes. 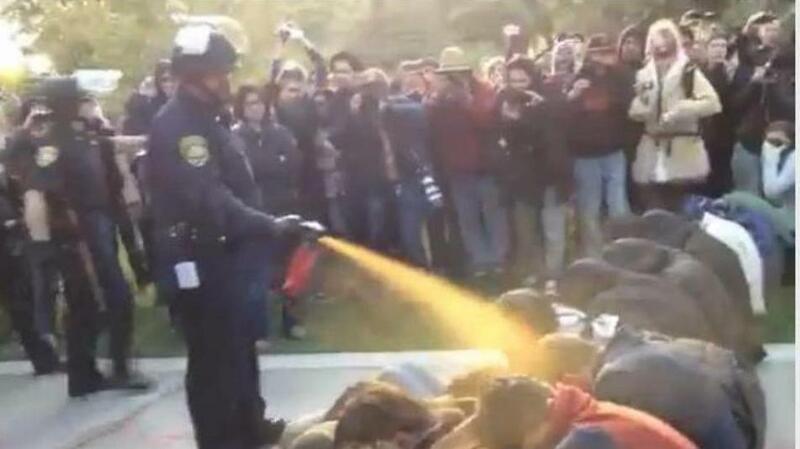 "The Occupy UC Davis students were sprayed as they sat on the ground." The American Civil Liberties Union of Northern California is assisting the 19 students and alumni who are suing. The case is now before the U.S. District Court, Eastern District of California, and the complaint has been filed against UC Davis Chancellor Linda Katehi and others, including campus police Lt. John Pike — the so-called pepper spray cop. The university's task force that's been looking into the pepper spray incident was supposed to have issued a report by now, but is aiming for issuing its findings in "early March." If you haven't seen the video that went viral after the incident, it's here.